In the afternoon following my zip line experience, and almost three years to the day since I last visited the sugar cane refinery of Bois Rouge for a night-time visit, I found myself visiting the refinery for a visit during the day, followed by a tour of Savanna distillery, which I'd also already done (in 2014) but never just after the refinery visit (it wasn't cane harvesting season at the time). So here are a few photos in daylight, but for more information do check out the two blog posts at the bottom of this page. The whole visit takes two hours: 90 minutes of factory and distillery visit, followed by 30 minutes of rum tasting. 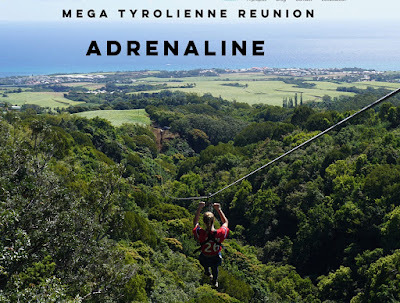 On Wednesday I had the opportunity to try out the recently-opened zip line in the hills above Sainte-Marie, not far from where I live. 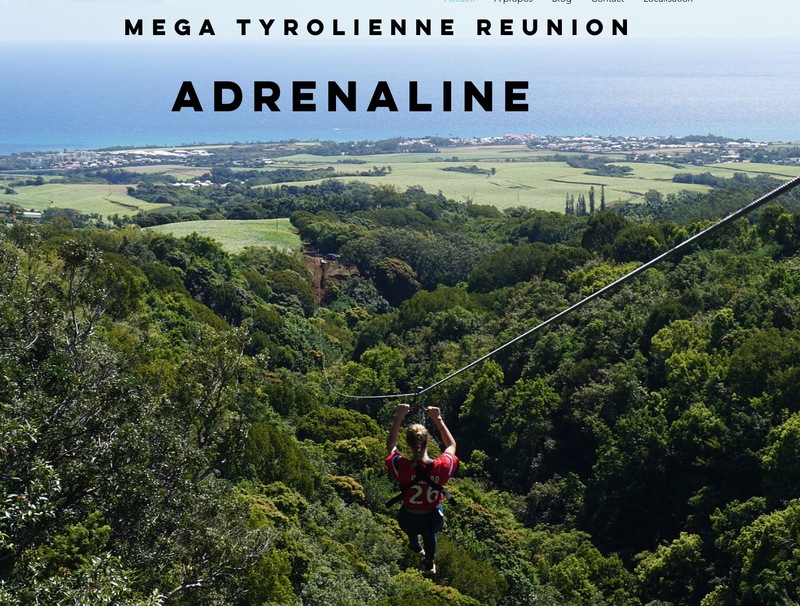 At 766 metres it's the longest zip line in Reunion. An expression which can be roughly translated as "Are you up for it or not?!" 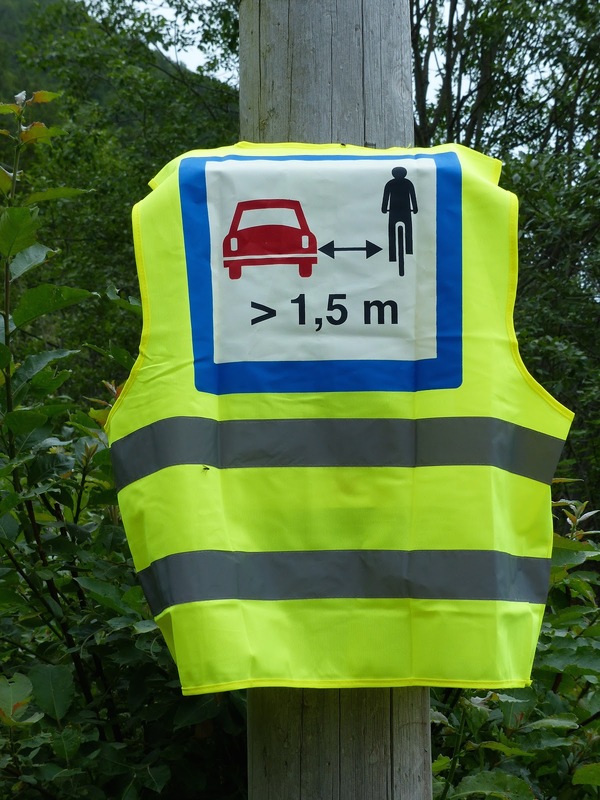 Apparently you can reach speeds of up to 90km/hour! 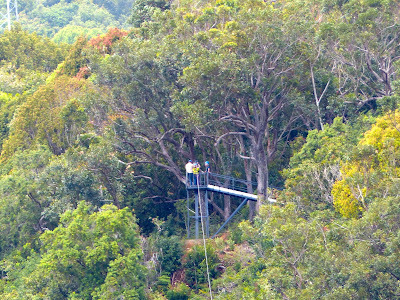 The owner said about 90% of visitors decide to do it a second time, and we were no exception! The three of us loved it! 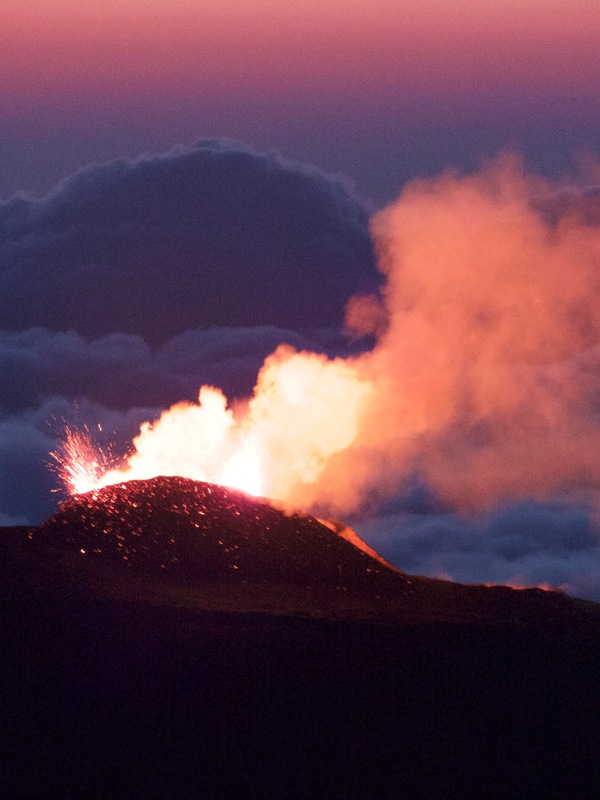 The fourth eruption in 2018 of Reunion Island's volcano, Piton de la Fournaise, (one of the most active volcanoes in the world) started early on the morning of 15th September. 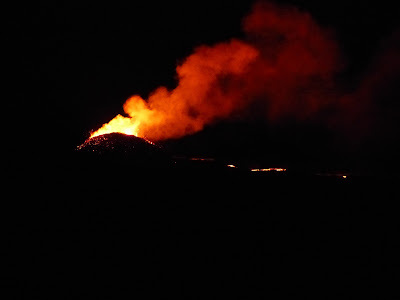 As I had a family member arriving to visit a few days later and so had already booked the volcano gîte for the night of 22nd September, we were pleased it was still erupting when we went there to stay. 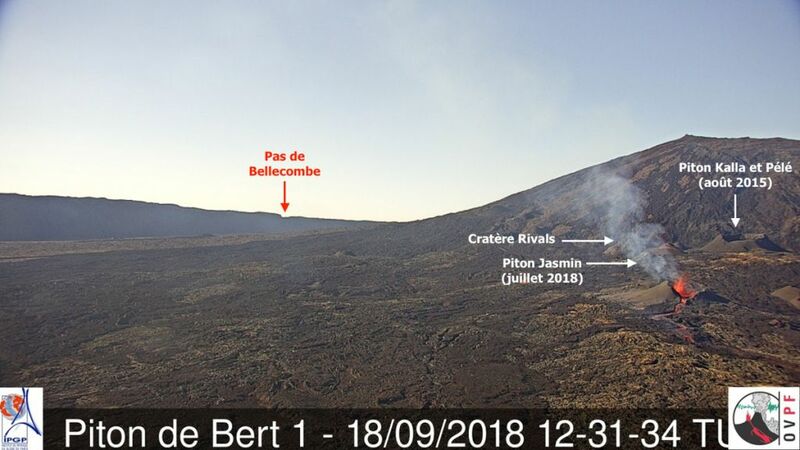 After checking in at the gîte we headed to Pas de Bellecombe from where the eruption was visible once night started falling. After a (short) night at the gite we got up at 4am, drove the few kilometres to the 'Foc Foc' car park, and then started hiking. Even at the car park you could clearly see the red glow of the eruption in the sky, and our first glimpse of the lava itself came after walking for about 40 minutes. 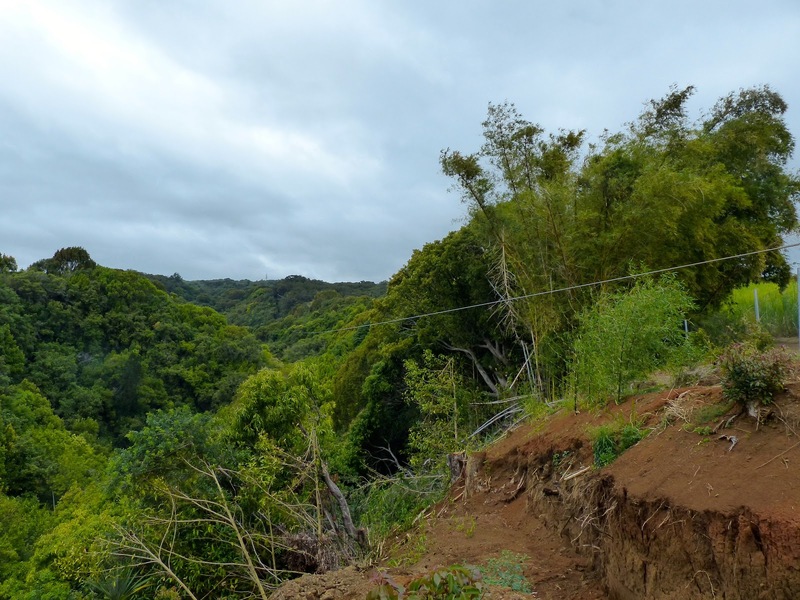 We carried on hiking along the ridge edge until just after sunrise. 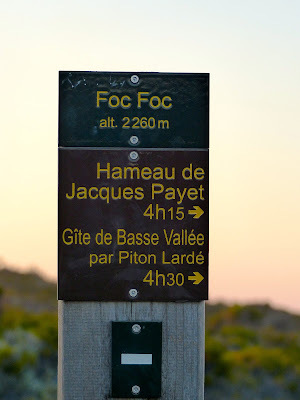 After watching the sunrise we hiked a bit more (a little further than the Foc Foc sign), before turning round and heading back. On leaving Bergen we flew up to Tromsø, 70°N of the equator. This is the furthest north I'd ever been, as when we'd visited Iceland it's 'only' 65-65° north. As we were visiting in summer we were in the land of the midnight sun, and the week after we left the sun set for the first time in two months. 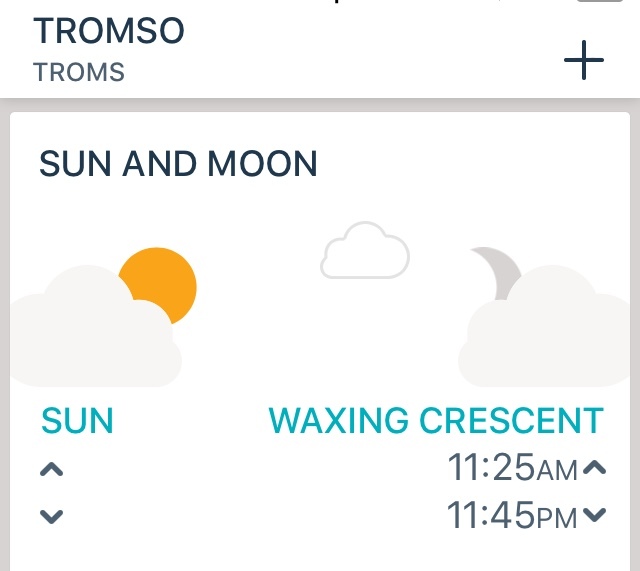 Its latitude also means that from late November until late January the sun never rises, and Tromsø is apparently a great place to see the Northern Lights in winter. Tromsø has a population of 75,000 and is the largest town in northern Norway. 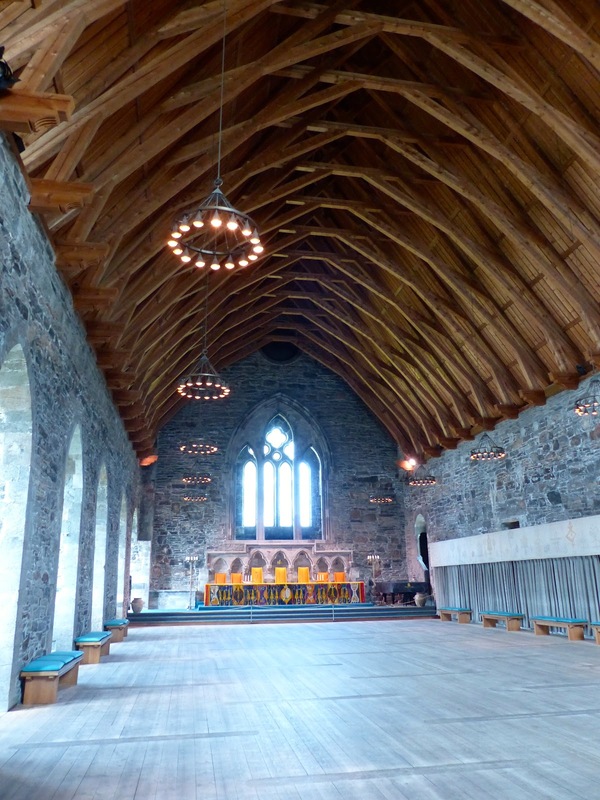 It's home to the world's most northernmost brewery, botanical garden, and cathedral. 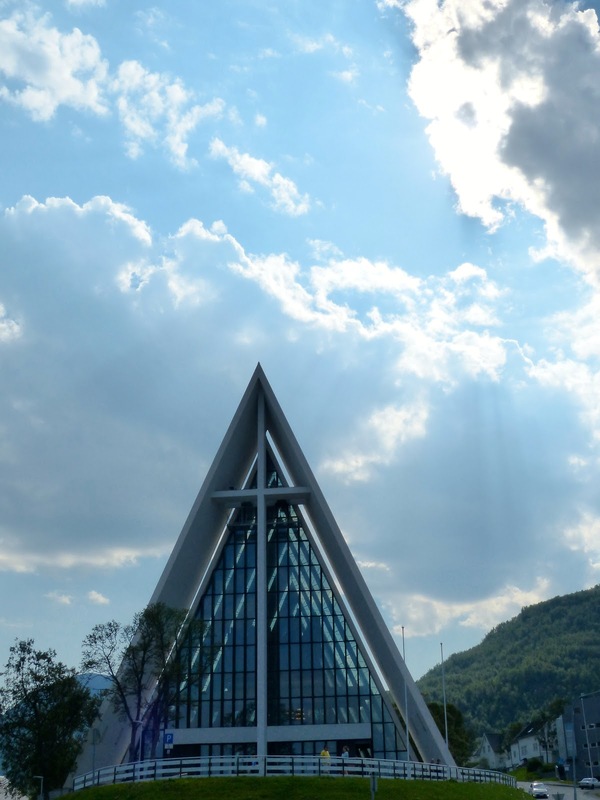 The building in the photo below is often referred to as a cathedral, but it's actually just a large parish church at Tromsdalen; Tromso's 'real' cathedral (the largest wooden cathedral in Norway) is located on the north side of Tromso bridge in the city centre. Tromsdalen church was built in 1965 and has eleven arching triangles that are supposed to suggest glacial crevasses and auroral curtains. Tromsø is built on an island, Tromsøya, and the Arctic Cathedral is actually across a bridge, on the mainland. 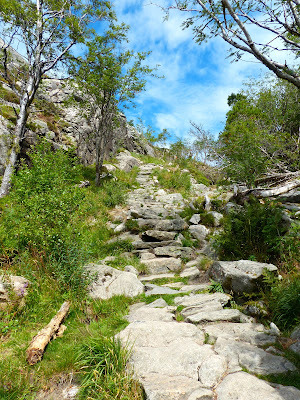 Afterwards we took Fjellheisen cable car up to Mount Storsteinen (421m), from where there are good views. The next day we hired a car for one day (just like in Bergen it was eyewateringly expensive, but at least this time we got upgraded!) 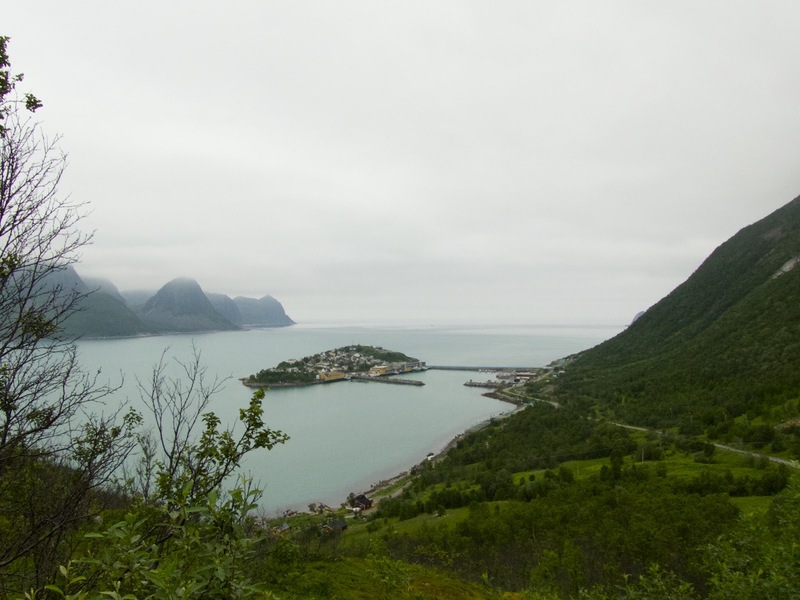 and went to visit Senja, Norway's second largest island (not counting the Svalbard archipelago). Unfortunately unlike the previous and following day it was cloudy, but we still saw breathtakingly beautiful landscapes (although I feel the photos doesn't do it justice). Only about 10km out of Tromsø we came across a group of reindeer by the side of the road. We stopped to take some photos but didn't want to spend too much time because we had a ferry to Senja to catch (the next ferry was only 5 hours later! ), and thought that in any case we'd see more reindeer elsewhere. But in the end these were the only ones we saw (alive, as we saw reindeer meat on menus at several occasions!). 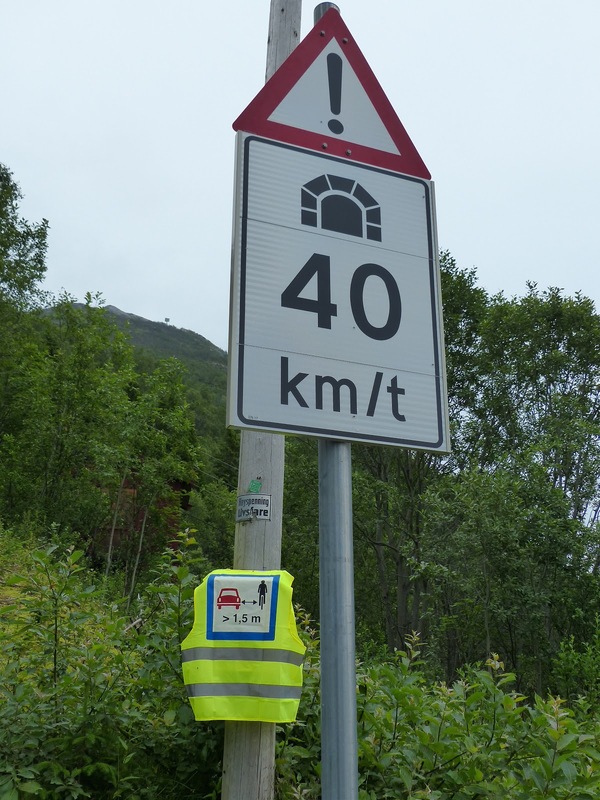 Norway is a land of tunnels (apparently the joke goes that if Everest was in Norway they would have dug a tunnel underneath it), and we saw many during our Senja roadtrip. 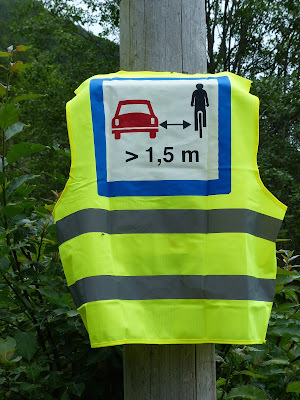 As some of these could be quite narrow the local municipality has put in place a system of hi-viz vests for cyclists. 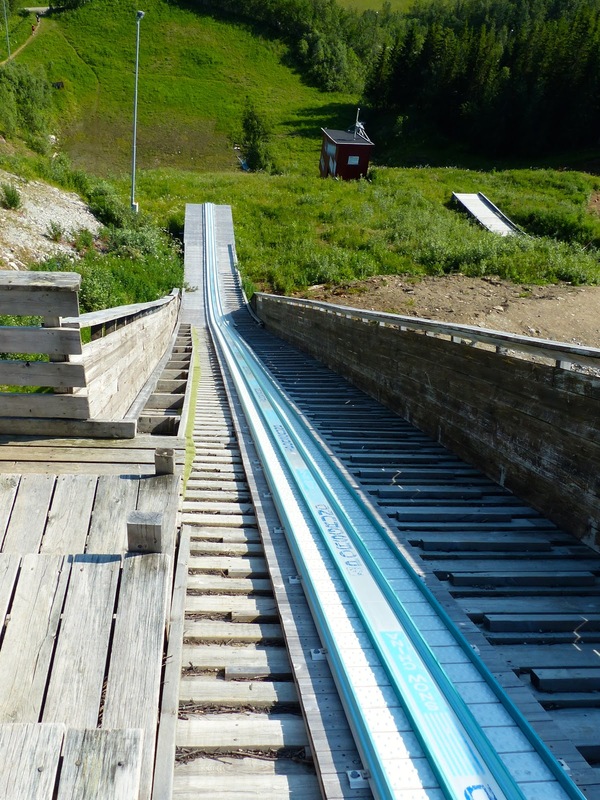 A box containing vests is placed at the entrance, and you can borrow one to ride through the tunnel. You then put it back in another box on the other side. A simple but effective system. Talking about bikes, on our final day full day in Tromsø we chose to hire electric ones, and cycled about 26km almost all the way round Tromsøya island, in a clockwise direction. We stopped for a picnic lunch beside Prestvannet (known as Báhpajávri in the local Sami language), which is a small lake at the highest point on the central part of Tromsøya. 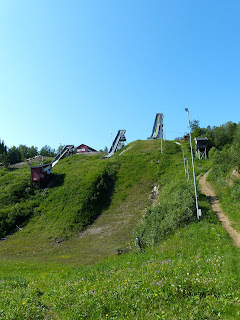 The surrounding area is criss-crossed by paths used for recreational purposes (walking, running, cycling in summer, and cross-country skiing in winter). 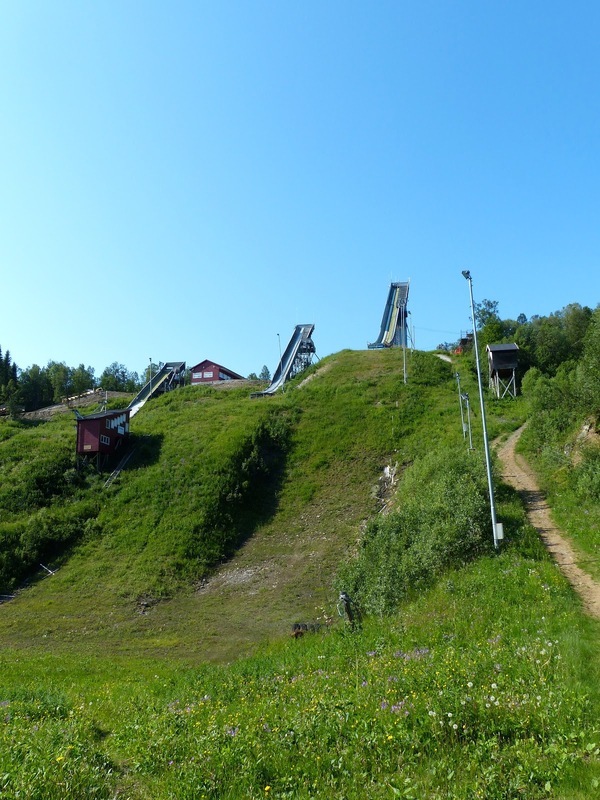 Not far away are the world's most northerly ski jumps. This is the vertigo-inducing view looking down. And this is the view looking up. We had time for a last cycle on the morning before we left Tromsø, and this time headed to Tromsdalen, crossing the bridge on our bikes to get there. As it was a Sunday morning everything was very quiet. 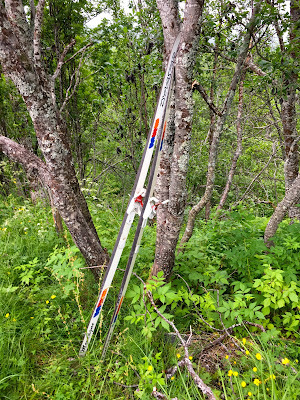 At one point in the forest I saw a pair of skis propped up against a tree, and to me this is typical of the Norwegian attitude: everywhere we went lost objects were not stolen, but left in a prominent place to be recovered by their owners. 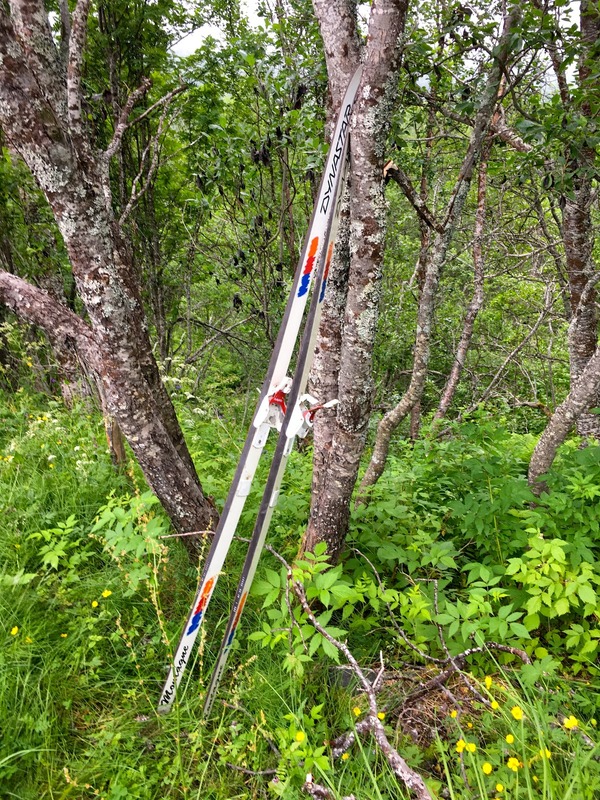 skis waiting for their owner to find them again? Then it was time to head back to Oslo for less than 24 hours, before leaving Norway and carrying on with the rest of our travels. On leaving Oslo we travelled to Bergen by train. We're no strangers to rail trips, having taken the Trans-Siberian, Trans-Mongolian and the world's highest railway as well as travelling around Japan by train. This was a comparatively short journey of 'only' 496 kilometres, but the Bergensbanen is considered to be one of Europe's best train journeys. Built between 1875 and 1909 the Bergen Line climbs to 1200m and takes six and a half hours, during which it goes through 182 tunnels! The highest station, Finse, is at 1222m and the line climbs up to 1237m when it crosses the desolate Hardangervidda plateau, making it the highest mainline railway line in Northern Europe. Located on the west coast of Norway, Bergen is the same latitude as Oslo (≈60°N) but we found it quite a bit cooler! 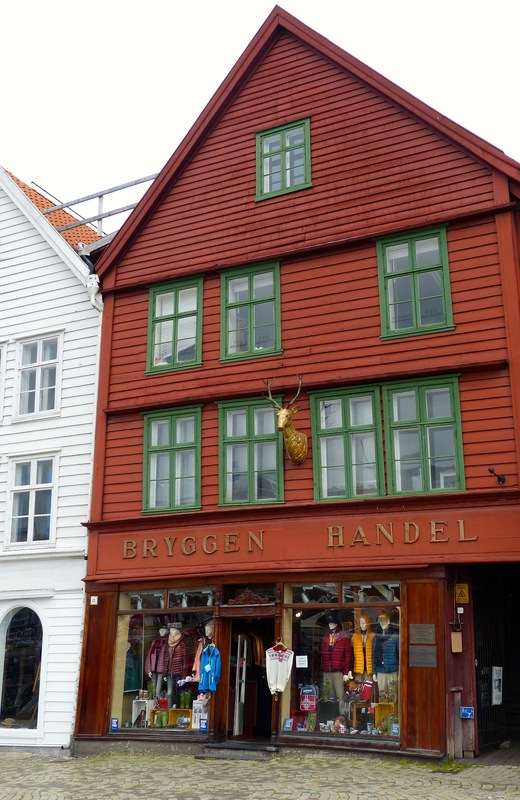 Norway's second-largest city is well-known for its wooden gabled buildings at Bryggen waterfront, a UNESCO World Heritage site since 1979 (Bryggen means 'the dock'). Bryggen currently comprises 58 buildings which date from the early 18th century, although the building pattern is 12th century. 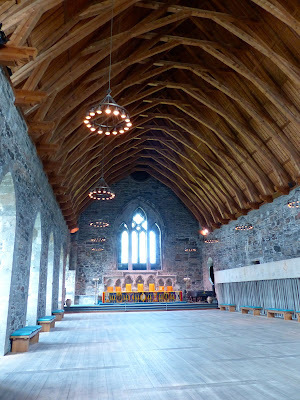 We also visited Bergenhus fortress which contains a number of buildings including Rosenkrantz Tower and Haakon's Hall - the latter is the largest secular medieval building in Norway. On our second morning we visited Old Bergen open-air museum which lets you experience the atmosphere from a time when Bergen was Europe’s biggest wooden city. 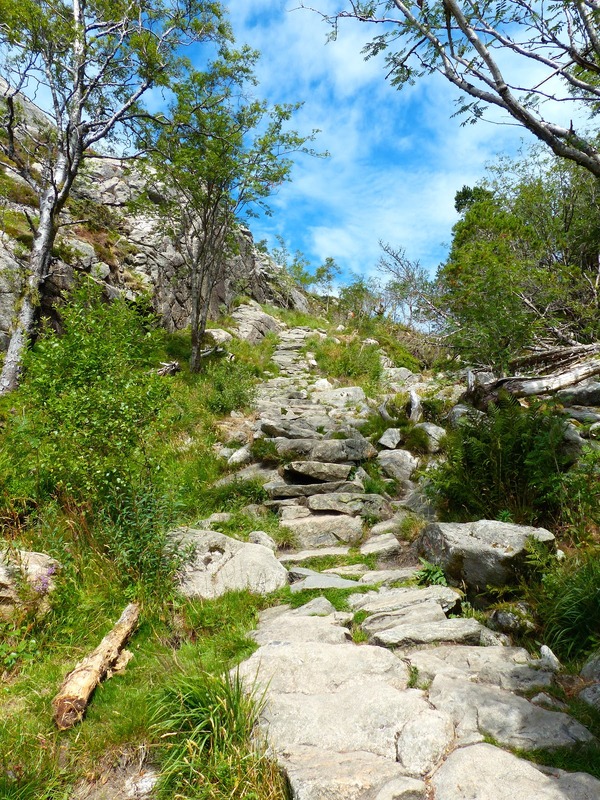 We then hiked up Stoltzekleiven, a steep (315 metres elevation) paved trail with 801 steps that leads up to Sandviksfjellet, one of Bergen's seven 'mountains'; the city has been compared to Rome for this reason. Coming from Reunion, I call them hills as the highest, Ulriken, is only 643 metres above sea level! To get back down we took the funicular from Fløyen. We hired a car for the next two days (eyewateringly expensive to do in Norway! ), and on the first day headed inland to the Western fjords. We parked our car at Gudvangen, took a bus to Flåm, and from there went on a two-hour cruise through Aurlandsfjord and Nærøyfjord. The latter is a beautiful 17km-long UNESCO World Heritage site fjord, surrounded by towering cliffs 1200m high. When we returned to our car we drove along the road beside the fjord back to Bakka and were stopped by a (Shetland?) pony who wouldn't budge from the middle of the road! On our way back we stopped at Stalheim Hotel which is located high above the Nærøydalen valley and has fantastic views. For our final day we explored the Hardangerfjord area: classic Norwegian fjord country. At 179 km long the fjord itself is the fourth longest in the world, and stretches from the sea south of Bergen to the mountainous interior of Norway along the Hardangervidda plateau. Steinsdalsfossen waterfall is one of the most visited tourist sites in Norway. The waterfall is only 50 or so metres high, but you can walk behind it while staying dry. While driving around this area we had several views of the Folgefonna ice field - the third largest in Norway, with three glaciers covering 168 km2 and ice up to 400 m thick in places. By the way, all the bus stops we saw in the Norwegian countryside had grass-covered roofs, sometimes even bin shelters had grass roofs too! 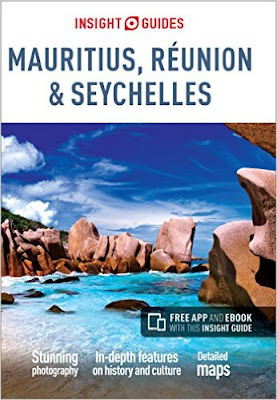 “Travel is fatal to prejudice, bigotry, and narrow-mindedness"
"Thursday's child has far to go..."
Brit born expat, professional French to English translator (http://smart-translate.info), traveller (66 countries and counting! ), scuba diver, hiker, reader, tea drinker. 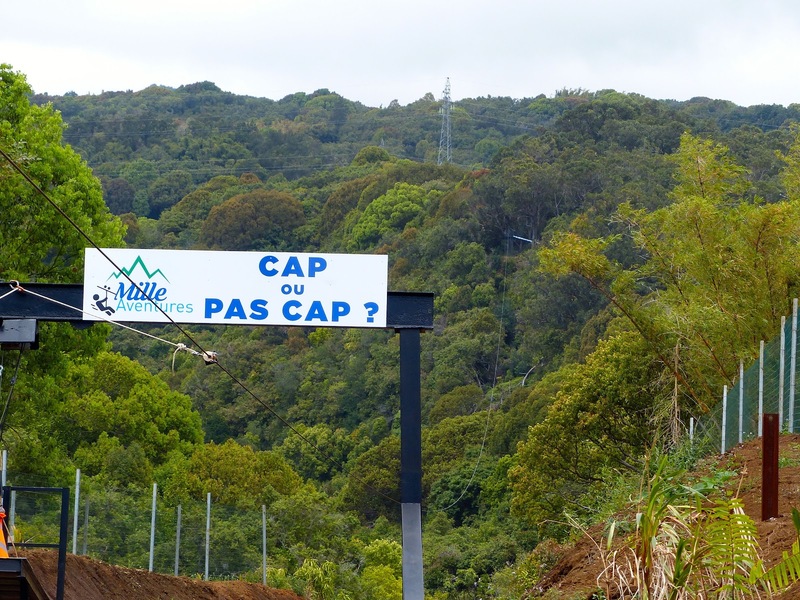 As of 2018 I have lived on Reunion Island for a total of about 24 years since 1990, as I also lived in Seoul, South Korea 2008-2011. North Korea: should you visit? 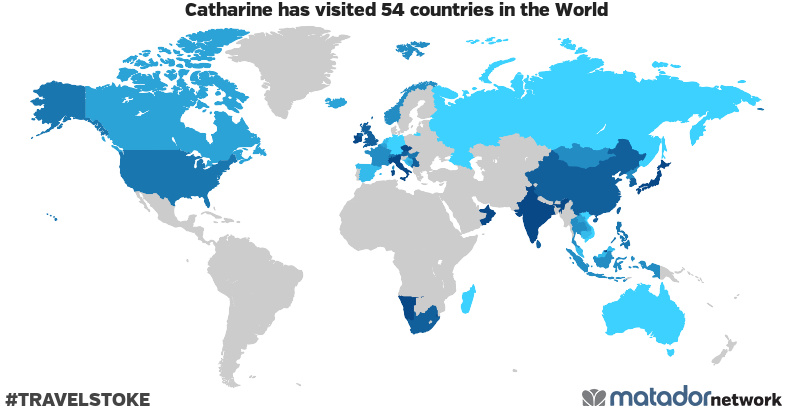 Catharine has been to: Andorra, United Arab Emirates, Austria, Australia, Bosnia and Herzegovina, Belgium, Brunei, Canada, Switzerland, People's Republic of China, Czech Republic, Germany, Spain, France, United Kingdom, Guernsey, Hong Kong, Croatia, Hungary, Indonesia, Ireland, India, Iceland, Italy, Japan, Cambodia, Comoros, Democratic People’s Republic of Korea, South Korea, Laos, Sri Lanka, Madagascar, Mongolia, Mauritius, Maldives, Malaysia, Namibia, Netherlands, Norway, Oman, Philippines, Reunion, Serbia, Russia, Seychelles, Singapore, Swaziland, Thailand, Tibet, Taiwan, United States, Vietnam, Mayotte, South Africa. © Catharine Cellier-Smart 2004-2018. Watermark theme. Powered by Blogger.